Fascist Marine Le Pen and banker Emmanuel Macron go through to the second round of the French Presidential election. 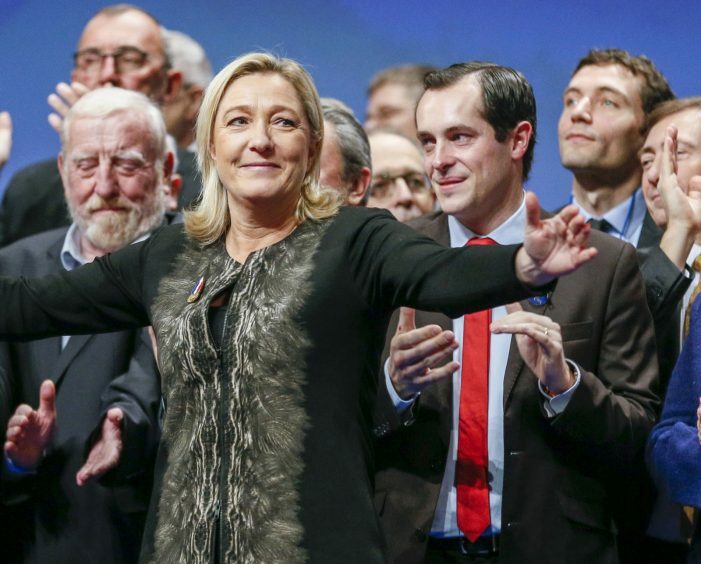 After an incredible election campaign, dominated by revelations about the corruption of the right wing candidate François Fillon and the fascist Front National leader Marine Le Pen, the Nazi candidate finally made it through to the second round where she will face the banker and former Economy minister Emmanuel Macron. But the election was closely fought, and the outcome by no means a foregone conclusion : Macron got 23.85 %, Le Pen 21.53 %, followed by Conservative party Les Republicain’s candidate François Fillon at 19.94 % and the radical Left leader Jean-Luc Mélenchon, at 19.62 %.Together, Mélenchon and Socialist Party (PS) candidate Benoit Hamon, got around 25 % of the vote. Hamon won the PS candidature in a rejection of the PS’s austerity politics, but his radical impetus was quickly stifled by PS bosses, who then abandoned him to throw their weight behind Macron. Former Prime Minister Manuel Valls came out openly in support of Macron, while Hollande launched a series of attacks on Mélenchon in the final days of the campaign and did all he could to boost his former minister, Macron. Like the Blairites with Corbyn in Britain over 200 PS deputies openly supported Macron. He is the candidate of the political establishment and austerity politics. Le Pen’s result, 7,680,000 votes, is a big increase for her, and shows how dangerous the fascist threat is becoming in France. She got 6,421,000 in the first round of 2012, and her party got 6.8m votes in the regional elections in 2015, its highest score ever. With a General Election coming up in June, the far right will be looking to turn her gain into seats in Parliament. But Le Pen faced serious resistance during the campaign. 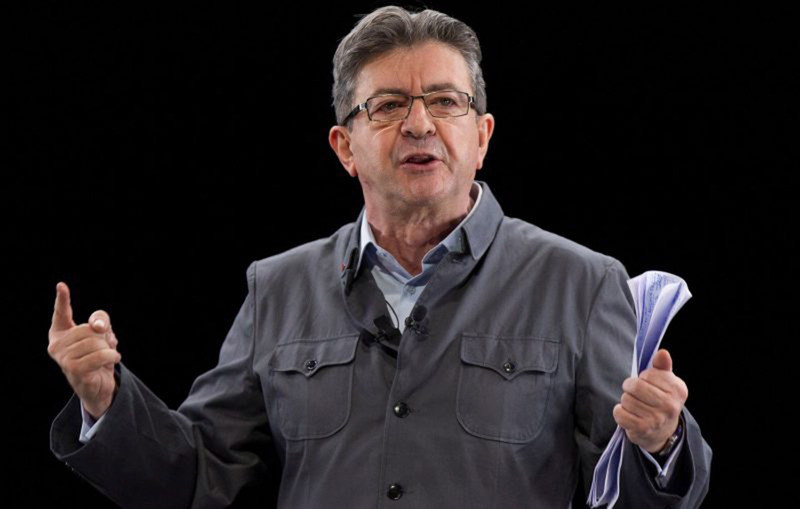 Her status as anti- system ‘outsider’ was seriously challenged by the radical left led by Jean-Luc Mélenchon (pictured left). Le Pen was initially seen as favourite, with some polls predicting she would get 27 % of the vote, but she soon ran into difficulty. Her corruption and her claim to represent ordinary working class people were strongly challenged by the New Anti-Capitalist Party’s (NPA) Philippe Poutou in the national TV debate at the beginning of April. And in a fantastic campaign, Mélenchon rose from around 10 % to take 19.6 % of the final vote. 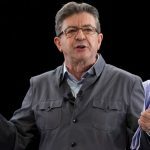 Thousands of people turned out for rallies to hear Mélenchon denounce austerity and corruption. He promised to restore and improve health services and social security benefits, increase minimum wages, and shorten the working week. Le Pen responded with intensifed race hatred and chauvinism, claiming France was not responsible for deporting the Jews in the infamous Vel d’Hiv roundup. She increased anti-immigrant rhetoric after a policeman was shot on the Champs-Elysees. But, in fact her vote declined and she lost out to Mélenchon in a number of big cities. In Paris, he topped the poll in the working-class 18th and 19th arrondissements. Le Pen barely got 5 % of the vote in Paris as a whole. Mélenchon also beat Le Pen into second place in her party’s stronghold, Marseilles, and topped the poll in big cities like Toulouse, Lille and Montpellier. With the two main parties, the Conservative Les Republicains and François Hollande’s PS in a shambles after the election, the ‘centre ground’ of French politics has clearly exploded and everything is up for grabs. Melenchon’s campaign gave people hope. This hope that a better society can be won is an important part of defeating Le Pen. Wrapping ourselves in the French national flag, as Melenchon has been tempted to do, is not going to help fight Le Pen’s ‘patriotism’. Now the partisans of austerity from François Fillon to François Hollande, are calling for a vote for Macron, supposedly to defeat Le Pen. But austerity will not defeat Le Pen, and Melenchon has so far not repeated the call, nor has the NPA’s Philippe Poutou. If Melenchon had faced Le Pen in the second round, we can be sure the Right would not be calling for any such Republican Front. Instead of just voting Macron, we need to carry the anger forward with a movement on the streets. Hundreds of young antifascists and anticapitalists fought with police last night in Paris. There are also calls to build May 1 into a big antifascist demonstration. We must make sure that the anger– against austerity, but also against racism and police violence – expressed in the Mélenchon campaign and those of the revolutionary left parties like LO and the NPA – is not wasted. Rather than just voting Macron, we need to contest both Le Pen’s fascism and Macron’s austerity policies on the streets and in our workplaces.